What Does Carnival Nationz and Rihanna Have in Common? So this was a weekend of pictures of Rihanna and Adrienne Bailon in black swimwear. Reminding me of that 'black' Carnival Nationz costume, Shang Dynasty which would have been an ideal pick for the Scotiabank Toronto Caribbean Carnival in August! Shang Dynasty eventually became a front runner when I thought of the one day only Toronto carnival summer festival. I've also worn one too many white and silver costumes. Most recently TRIBE's Cyprus costume, that a black costume such as Shang Dynasty just appeared fierce. You know a lil' of the bad girl! ... with that wet suit look, with its accents of gold and turquoise. Any how, I can't complain since the section I eventually picked, thanks to different friends rallying me to join them was the first to sell out on day one of the Carnival Nationz registration. Our section is Aztec. 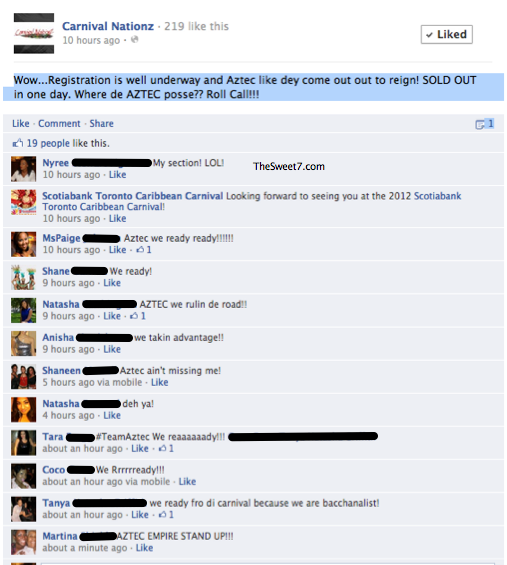 ... And I have other friends pissed and considering skipping this year since Aztec sold out before they got a chance to register. Maybe after this post, Shang Dynasty may be considered.